Crow Fair, 1973. My wife and I are medical students working on the Crow Indian Reservation in southeastern Montana. We live in a small house on the reservation, near the small hospital, on the banks of the Little Bighorn River, yes, THAT Little Bighorn River, 5 miles from where Custer met his end in 1876. This was our second summer there, so people knew us in Crow Agency. We saw patients from Lame Deer, on the Northern Cheyenne Reservation; Lodge Grass, Wyola and Pryor. We worked at the hospital, delivering babies, helping with surgery, suturing wounds, treating emergencies, and learning to do what few medical students learn: how to give shots. One day, I heard a man had collapsed in the dry riverbed of the Little Big Horn, downstream from our small, orange house. I was told to go to see what happened. I can still remember walking down the mud bank, alone, to the body of an elderly Crow man lying supine, seeing sand on his corneas. It was the first time I had pronounced a man dead. There would be thousands more in my career, but they would all be in technology-laden hospitals, with people around me, not alone with a man, probably born about 20 years after Custer’s demise. I still remember the names of the two women on whom I first scrubbed in surgery, the the man upon whom I passed my first nasogastric tube. I remember the first time I was called “Doc,” by a man, whose foley catheter I changed, not really having any idea what I was doing by injecting air into the balloon. Nobody was present; I was expected to do it. I did fine, got thanked, took a deep breath, and returned to the nurse’s station. Our equipment was rudimentary: We had an X-Ray machine and small lab. This was before CT. Major emergencies were sent to Billings, 70 miles away, now on Interstate 90, but earlier on US 212, now called the Hardin Road, or old US 87 (it was US 212 in 1970, when I first drove it), a two lane paved road rutted from use. I hit a deer on it one night, doing about 65, smashing the windshield. We were lucky it didn’t come into the car. Sadly, it was not dead, and we had to kill it. The next day, the Crows told me to drive around with the windshield smashed, like all the other cars there. We got it repaired, instead. Crow Fair was an annual celebration in August, a major gathering of tribes from all over the western United States. There was a lot of work that week in the hospital. We were among the few whites there, but we were members of the community, and while many Crows remained aloof, I never remember feeling unwelcome. The only thing we weren’t allowed to do was learn the language. Many said they would teach us, but they never did, and when we used words that we knew both the meaning and the pronunciation, they acted like they didn’t understand. Later, that happened to me in France, and my French was a lot better than my Crow. The white man had taken nearly everything they had; they weren’t going to give him their language, too. We named one of our first cats “Saba,” which was Crow for “What?” if the word is dragged out. The other cat was “Busby,” a town on the Northern Cheyenne Reservation. During the Fair, I was in the emergency room when a man walked in, with a 15 cm gash in his forehead, after being gored by a bull. “Hurry up, doc,” he said, “I’ve still got time for the second round.” I can’t say I did the best suturing job in the world, but after two summers there, I was good at it. He returned to the rodeo. These people were tough. Yet, times were rough. In 1971, there was a diphtheria epidemic on the reservation. Yes, diphtheria. I don’t remember who got the idea to dress me up and have me ride in Crow Fair. Those two summers were the only time in my life I ever rode a horse. We first rode near Billings, at a ranch where part of “Little Big Man” was later filmed. A real doctor there and his wife had horses, so we rode at Crow Agency as well. My wife now has 5 and rides; then, we were newlyweds, and I learned to ride, although I would not continue. The morning of the parade, I was given an honor that I have never forgotten: I was the only white man riding. The only white man. I rode a horse named “Mare,” who was one. She was perfect for me; nothing fazed her. 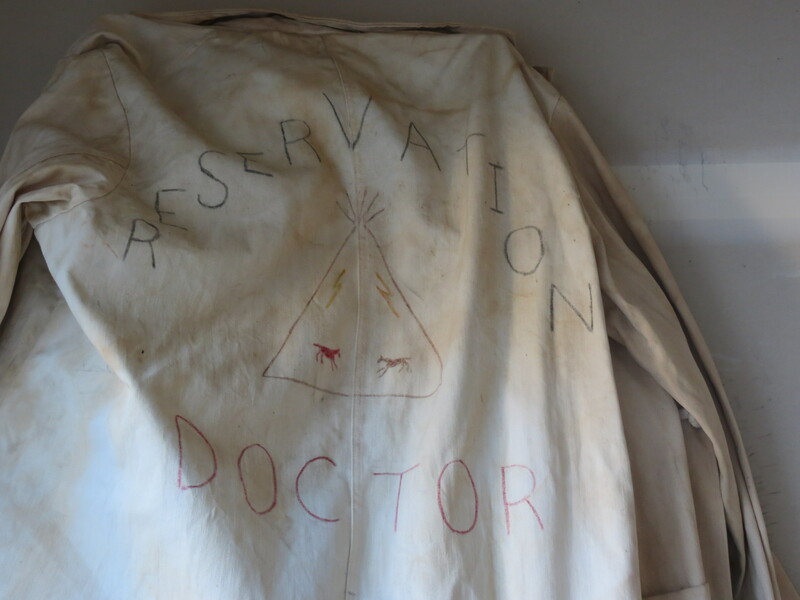 I wore a white coat with “Reservation Doctor” written on the back, along with a tepee with a few symbols, drawn by a member of the tribe. My black bag was on the saddle’s horn; for 15 minutes, I was part of the parade that rode around the rodeo grounds. Many laughed, but with me, not at me. I was totally welcome. I still have the white coat and the black bag. Many times, cleaning out the garage, I wondered whether it was time to throw the white coat away. I haven’t worn it in 41 years, but after the picture posted here, I put it on again, just to do it. I will never part with it. The jacket has no intrinsic value; after I die, will it be thrown away. Only my wife knows the story behind it, “Mare,” and saw me ride with the the white coat. Today, we would be probably post a video on YouTube or Facebook. Then…and now, what we have are memories. The memories may be wrong. I wouldn’t trade those imperfect memories for a clear video on YouTube, a powerful statement that those too young to remember a time without YouTube might consider. The white coat signified the summer I was a “reservation doctor.” I rode in the Crow Fair parade, near the Little Bighorn, the only white man riding among Indians, and survived, honored, a far better outcome than Custer and his men, 97 years and 2 months earlier. It has remained one of the most special moments in my life. Reservation doctor. I felt in the pocket, and I found an old cup of “silly putty.”That dates the jacket as clear as Iridium dates a meteor strike. This entry was posted on March 12, 2014 at 13:00 and is filed under GENERAL STUFF, MY WRITING. You can follow any responses to this entry through the RSS 2.0 feed. You can leave a response, or trackback from your own site.